Ilha Grande stole my heart — and it also gave it a workout. Cardio and adventure fans alike will flip for the hiking opportunities on this untamed Brazilian island. With sixteen marked trails of varying length and difficulty, we were spoiled for choice when it came to which corner of Ilha Grande to wander. As we were hoping to cool our budgets and enjoy some solitude, we eliminated the trickier routes for which guides were recommended and stuck to the classics. We spent our three short days hitting three of the island’s most popular routes, and left daydreaming about our return to tackle a few more. 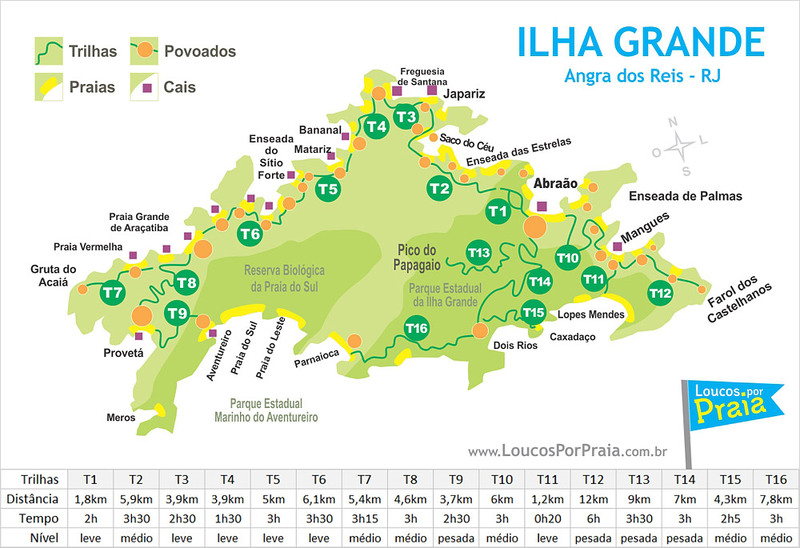 Leaving directly from the far East side of Vila Abraão, and connecting directly to Trail T11, together Trail T10 and T11 make up one of the most popular hikes on Ilha Grande. And we were perfectly positioned to tackle it: our hostel, Che Legarto, let out directly onto the path. A helpful sign at the start of T10 alerted us we were in for a 5.6-6 kilometer, 2.5-3 hour trek to reach the twin beaches of Mangues and Pouso. We set off a bit later than we’d hoped, around noon, but were still surprised to have the trail more or less to ourselves as we headed away from Abraão village. We’d dutifully let the receptionist at our hostel know where we were going before setting off, and were shocked when we checked to make sure we’d be able to buy more water along the way — and were told we couldn’t. So like good little responsible hikers we brought everything we’d need for the entire hike and then some, practically drowning ourselves along the way in an attempt to lighten our loads. Just over an hour into our trek we hit our first beach, Praia de Palmas. We quickly realized our receptionist had never done this hike when we saw enterprising locals all along the beach had hung out hand-painted signs advertising water, coconuts and other treats for the thirsty hiker for sale. It was the kind of beach we ordinarily might linger on, especially when we discovered it all but abandoned. Yet we had loftier stretches of sand in mind. And so onward we forged. Exactly another hour later (after a few lengthy photo stops), we hit Praia Mangues, and cheered as we soaked up yet another postcard-perfect beach. After a quick scramble over the rock separating Mangues from neighboring Praia Pouso, we paused to confirm with local boat captains about the return trip to Vila Abraão. Unfortunately for us slow starters, the last boat was at 4pm — but if you’re headed to these parts, check for yourself, since it seems to vary based on the sunset. By the time we got moving again to tackle the T11 portion of the trail, about two hours and twenty minutes had passed — and that included plenty of time for photo shoots and dawdling. From the end of Trail T10, we picked up Trail T11. Boat tours advertising transport to Lopes Mendes are actually a bit of a sham — in reality the boats cannot reach that side of the island due to waves, and the boat will actually leave you at Praia Pouso. So regardless of how you get to Praia Pouso, you’re getting to and from Lopes Mendes on your own two feet. The good news? At 2-2.4 kilometers, it’s just a 30 minute to one hour roundtrip trail. While the trail gets quite steep, it’s shockingly short — we made it from start to finish one way in twelve minutes. And while we were decked out in trainers from the bigger bulk of the hike, we saw plenty of people returning in flip flops. At this point, I’d really just been enjoying the journey and not worrying too much about the destination. But as we laid eyes on Lopes Mendes beach for the first time, I think my jaw may have actually dropped, cartoon-character-style. Lopes Mendes beach is often hailed as one of the most beautiful beaches in Brazil — and we could easily understand why. But even on this beautiful sunny day after a long stretch of rain, we really didn’t have to look to hard to find a wide space to spread out our cangas on. Unlike the other beaches we’d passed on our journey, this one had no permanent structures, yet there were plenty of locals with coolers hawking cold drinks and even snacks sandwiches, and we settled in to enjoy the last stretch of the day’s sun. In total, it took us 2.5 hours to hike the full 7.2 kilometer route to Lopes Mendes beach, plus a little bonus 1.2 kilometers to hike back to Praia Pouso for the boat ride to Abraão — which was a bargain and a blessing at 15R (or $4USD). Much as I loved getting there, I don’t think I’d have been up for the full trek back! Our only regret? Bringing so much water — we could have packed half — and not leaving first thing in the morning. Lopes Mendes truly is stunning, and you’ll want to spend literally every second you can there. On our last full day on Ilha Grande, we decided to tackle one last trail, the unassuming Circuito de Abraaão. This easy stroll covers 1.8 kilometers and takes about an hour to an hour and a half, according to the trail marker at the kick off. You could do this one in flip flops, as we ourselves did. This trail starts on the far side of Abraão, the opposite end from T10. Just walk as far as the road goes from town, and keep going. You’ll run into it eventually — but not before stopping to ooh and aah over beautiful views of the bay. What I really loved about this little loop were the near constant distractions of little stops along the way. We tackled the trail clockwise, and so our first stop was a viewpoint over Praia Preta. Not bad, eh? Next was an aqueduct viewpoint that we couldn’t quite see the aqueduct from, followed by an unspectacular waterfall. But all were lovely distractions from the physical exertion, which are always welcome in my book. Next up, the aqueduct! Now, this was cool. At eleven meters high, the twenty-six arches stretched so far deep across the jungle we couldn’t see either end, and felt like we’d stumbled upon a mysterious clue from the series Lost. Constructed in 1893 using stones and whale oil, the aqueduct still carries to Abraão village to this day. Eventually, we wound back to the coast and arrived on the beautiful shore of Praia de Galego. Here, we stopped for a well deserved beach break. When we’d had our fill of sun, we wandered next door to the Lazareto Ruins, a reminder of Ilha Grande’s seedy past. This now abandoned building has had many lives. Originally a farmhouse, in 1884 the structure was redesigned as a Brazilian Ellis Island, a quarantine stopover for European immigrants by order of the Emperor of Brazil in the midst of a devastating cholera epidemic. Closed in 1913, Lazareto was given new life as a penal colony from 1940 to 1954, and finally abandoned for good again in 1963. After lingering just a tad too long in the damp old ruins, I cheered when we reached Praia Preta. Here, we shared the beach with a few local pups, a fisherman who proudly showed us his catch, and other travelers vying for the last bits of beach at high tide. The the label “adventure paradise” is thrown around pretty loosely these days, I feel confident bestowing the title on this beautiful island. Equal parts beautiful and accessible, I can’t think of a better hiking destination I’ve visited recently — and we only brushed the surface! If you’re looking for an independent adventure in Brazil, look no further. While Ilha Grande feels idyllically safe, we still took some base-level security precautions — this is Brazil, which as guidebooks, other travelers, and our mothers warned us frequently, has a bit of a reputation for crime. Though we took the calculated risk of hiking with our cameras (after backing up all our memory cards), we carried very small amounts of cash and always told our guesthouse reception where we were going. While T1 and T11 were well-trafficed trails, T10 was quite desolate. Some trails should only be tackled with a guide — ask around if you’re considering others. Happy hiking! Next stop… Rio de Janiero! I usually love travel blogs for the pretty pictures and cool stories rather than trip planning, but this is one of those posts that makes me really want to visit a place, that Island looks perfect! That’s quite a compliment Sarah! Thank you 🙂 It’s the ultimate compliment for a travel writer to hear they’ve inspired a trip. Wow, thanks Steph! This comment made my morning 🙂 Love traveling with Heather… it definitely gets my creative juices flowing! How could anyone see those pictures and not add it to their bucketlists? I never considered Ilha Grande as a destination to visit, but it’s certainly on my radar now! Aw, love hearing that Dominique 🙂 Thank you! Me too Cate! Such a fun, healthy and generally affordable activity. Lopes Mendes beach–wow. Talk about a perfect place to spend an afternoon (and go swimming to cool down from hiking all day). On an unrelated note, I LOVE your bathing suit. Outrageously beautiful. OUTRAGEOUS, I say. You & Heather are the travel photo dream team. Question — are there any creepy crawlies, snakes etc. that one should be wary of when hiking this isle? Actually now that you mention it we were keeping an eye out for snakes, but I can’t quite recall if it was our own paranoia or if we were warned. There were a lot of language barriers going on in Brazil, lol. This sounds amazing! I adore hiking and also love places that are just easy to settle in and explore for a couple days, so it seems like my kind of place. I’m so glad you wrote about it though, I had no idea this place existed! Brazil just keeps moving up higher and higher on my list of places to visit! The pictures are wonderful and the hiking sounds awesome! Well stay tuned Megan… haven’t even wowed you with Rio yet 😉 So much more Brazil goodness to come! I haven’t been commenting much lately but do I ever love reading about my beloved Brasil. So excited to read your take on Rio! This post was interesting and the thought of hiking in this beautiful location leaves me longing to leave my UK shores! I hope so too, Janice! Fingers crossed! So, did the dog get to eat that crab? Or did he get a pinch in the face?! I think he did make a meal of it, in the end! It was quite the war to watch! Thanks Angela! More coming up soon… from Rio! Gorgeous!!! That aqueduct is stunning! Such a fun little find in the middle of the jungle! Really cool shots, I like the one of the dog eating the crab. That is rad. What happened to the dog though after he bit it?